Exit I-10 at exit 7 and go South on Pine Forest Rd. (SR 297) approx 3.4 miles and join US-90 South. Follow US-90 South approx. 1 mile, then turn right (West) onto Saufley Field Rd. (SR 296) for approx. 1.4 miles to Millview Rd. (SR 173). Turn left (South) on Millview Rd. which will become Blue Angel Parkway. Follow SR 173 South for approx. 4.6 miles and turn right onto US 98. Follow US 98 West approx. 3.8 miles. Turn left onto Bronson Rd. and follow it to the campground. Active, National Guard, Reservists, Retired, 100% DAV, DoD Civilians, Dependents, Guests. Reservations accepted through Central Reservations 877-628-9233. Cancellation 14 days prior. No same day check-ins. For rentals - One night deposit required. Camping can be reserved up to 1 year in advance for active duty and 6 months in advanced for retirees and DOD civilians. None available, except your own. 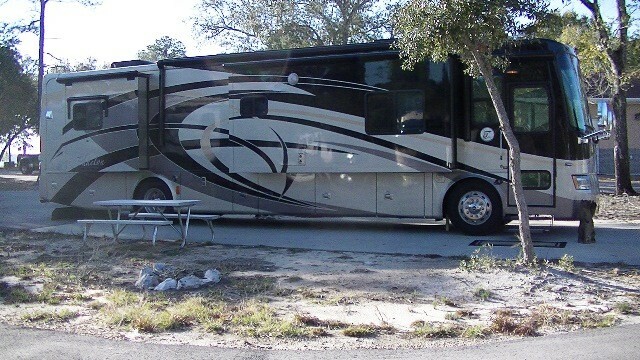 Pets are allowed in the RV area, but not the cabins, with usual leash and clean-up rules. 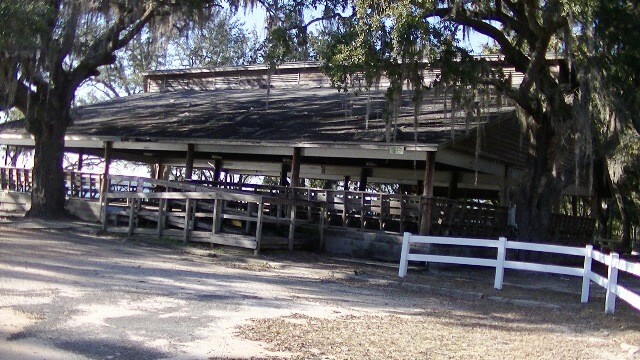 There is a daily admission rate. ($1 for military and $1.50 for DoD. $.50 for each additional person. Annual pass is available) Rates are for Military (low) - DoD civilian (high). 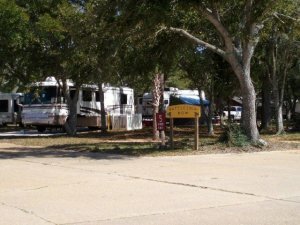 RV sites an additional $6 if tent set up. Cabin rates vary based on Military or DoD Civilian and season. 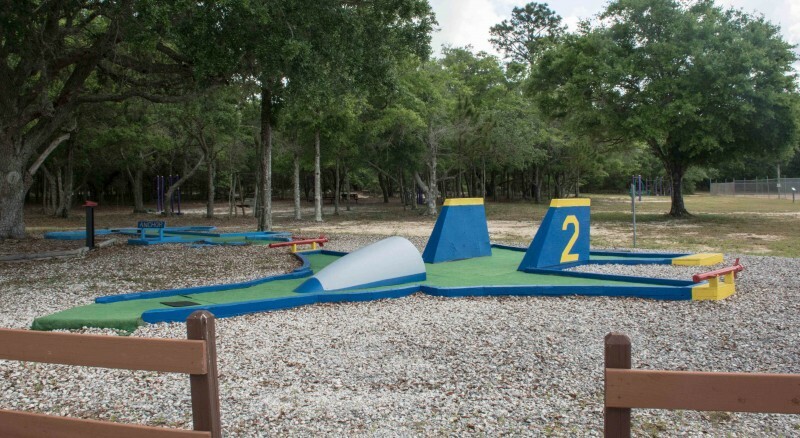 Disc golf, Paint Ball, Miniature golf, RV Storage, Propane. 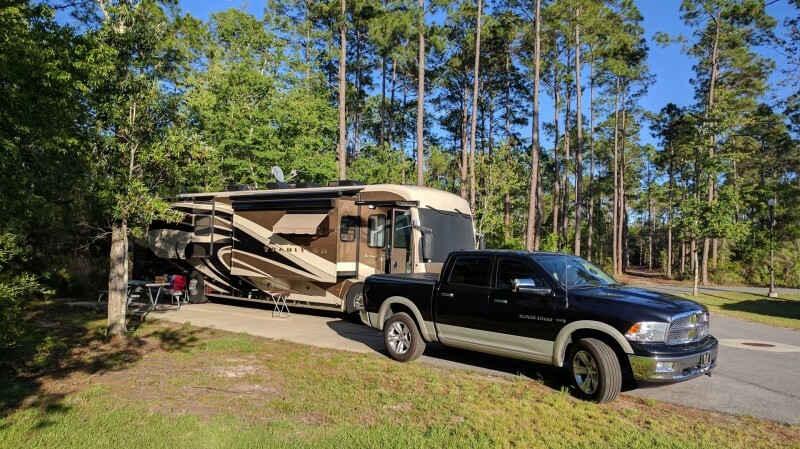 Very pleased with our first Military RV Campground. We checked in on Monday afternoon with reservations. 2 spots were open and both were equally as nice. 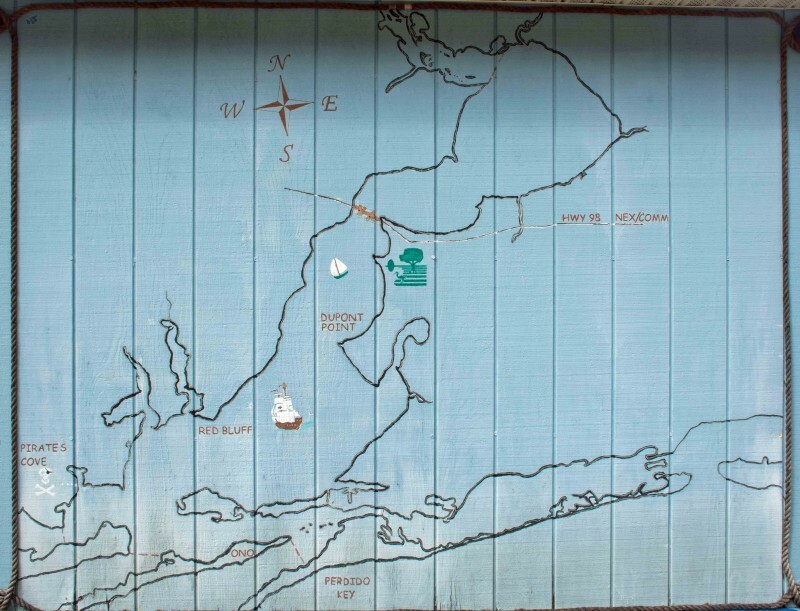 The sites were located in Battle Ship Row Campground. We will be here for 6 nights. We really like this campground. The people are super friendly and helpful. Bath House is clean and operational. The location near the water is very nice. Value for full hookup was $22 or $23 was totally worth it. 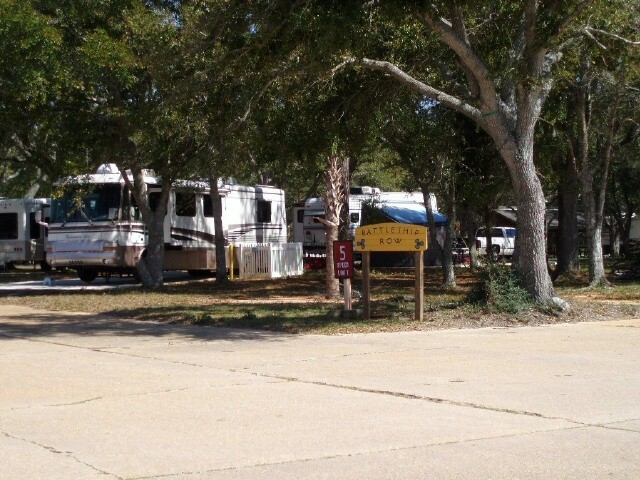 Very nice campground! 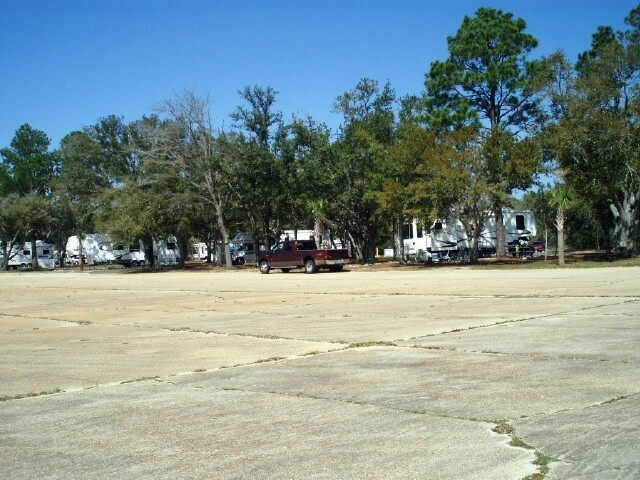 We stayed on Battleship Row (FHU) vs Anchor Cove (there are two campgrounds at Blue Angel Rec Area). We arrived after hours and didn't have any issues with getting into our spot. There are numbers on the welcome center door for POC's when arriving after hours. We dialed the number and contacted the Camp Host (John) and he was very helpful. He met us on the tarmac and took us by golf cart to find an open spot (we had reservations but not for a specific spot). John was very helpful and around anytime you had questions. The sites are large concrete pads and the roads are paved, this is nice because of the amount of rain we had during our visit. 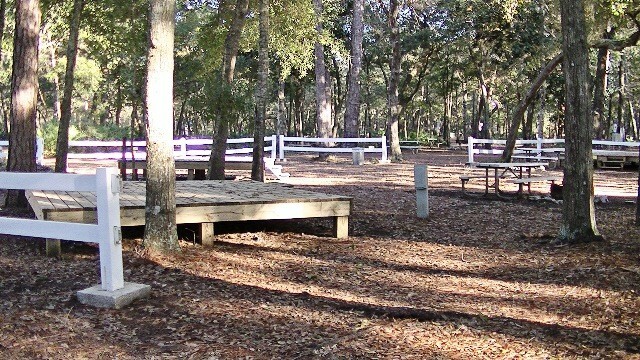 There is a picnic table at each site. The sites are not on top of each other and there is trees between most sites, very quite. There is NO WiFi however Verizon has a good signal. We were able to get about 25 channels just using our digital antenna, with all the major networks. Very clean park, I did use the shower facility on the last day and it was clean as well. 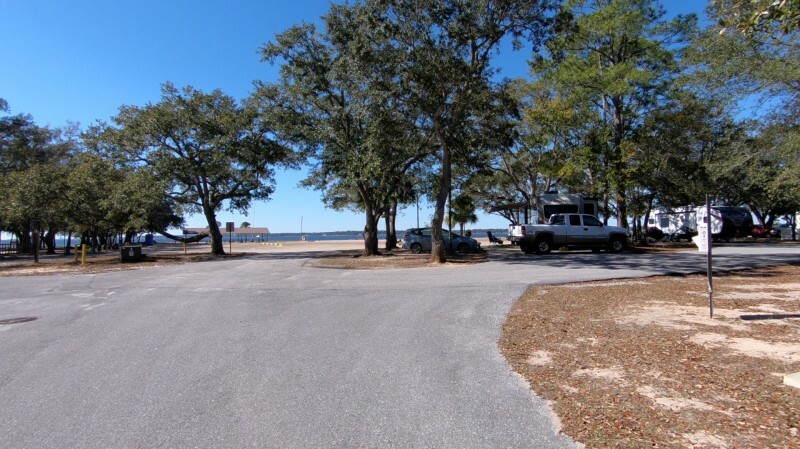 Pet friendly park, lots to do for the kids (two playgrounds), nice beach, mini-golf, kayak rental, volley ball court, Frisbee golf, and lots of trails. It is off the beaten path, so if you a planning to go site seeing (Aviation museum and Lighthouse on post) you will need a car. The commissary and NEX are 6 miles away when taking a right out of Blue Angel Rec Area and on to Highway 98, also there is a Walmart nearby. For the those individuals staying for a long period of time there is a VA CBOC and Base Hospital right next to the Commissary/NEX. 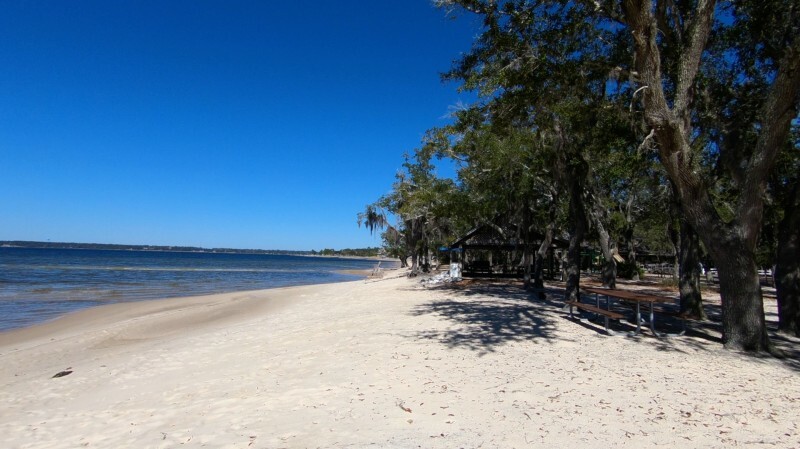 I would recommend this park to anyone staying in the Pensacola area. Great place! We arrived and I was a bit concerned that yes we had a reservation on Battleship Row, but the sites are first come, first served. My fifth wheel is 42 ft long + the truck. No worries. The lady quickly checked us in and said to proceed on down to the campground and contact the camp host who will help us find a spot. We proceeded down the road and a left turn past the long term storage to the campground. We parked near the long term storage area and walked to the camp host site. He is very friendly and helpful, He took us around on a golf cart and quickly found us a spot. Then he took me back to my truck and lead us into the spot. I would highly recommend this process rather than trying to maneuver around yourself looking for a vacant spot. We did not use the bathrooms but my wife used the laundry facilities several times. Four washers and three dryers, $1.00 ea. Very clean area. The camp hosts are around all the time and very helpful. We had a lot of rain and they maintenance people came by with leaf blowers to clean off the concrete pads. The fire rings are nothing to speak of, just a few stones in the shape of a ring. Streets are paved as are the sites. Very nice. This place is a ways off the highway but that is not all bad and is easily accessible. I would definitely stay here again. 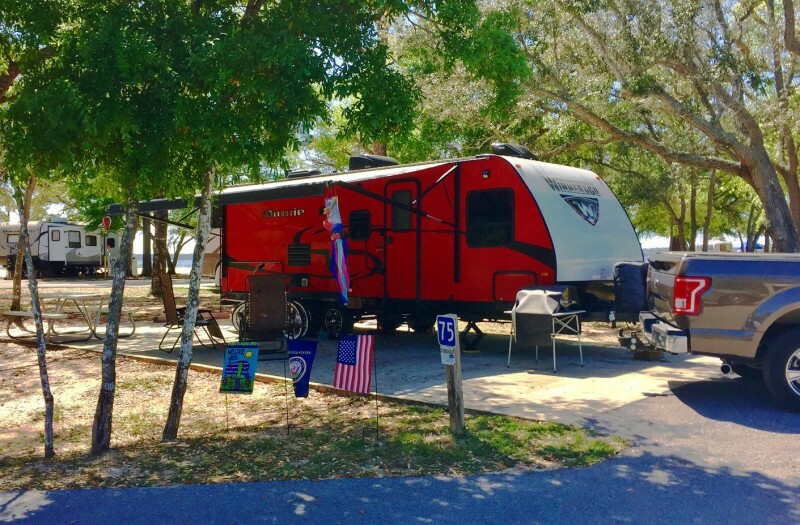 We loved this military campground located right on a beautiful bay. 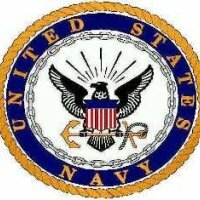 It is operated by Pensacola Naval Air Station, but is actually 9 miles outside of the NAS back gate off Highway 98. We stayed over on the full hook up side (Battleship Row), and were able to get reservations for 2 weeks in February. 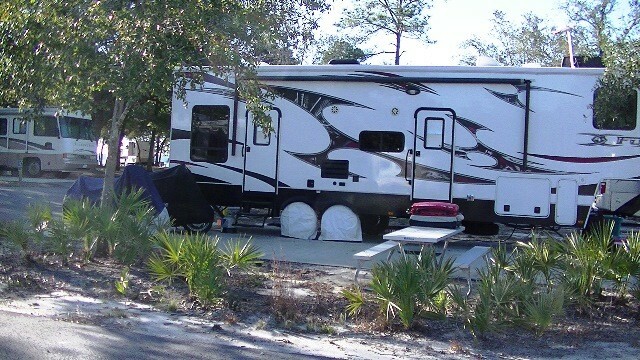 There is also a partial hook-up RV side which is closer to the mini golf. 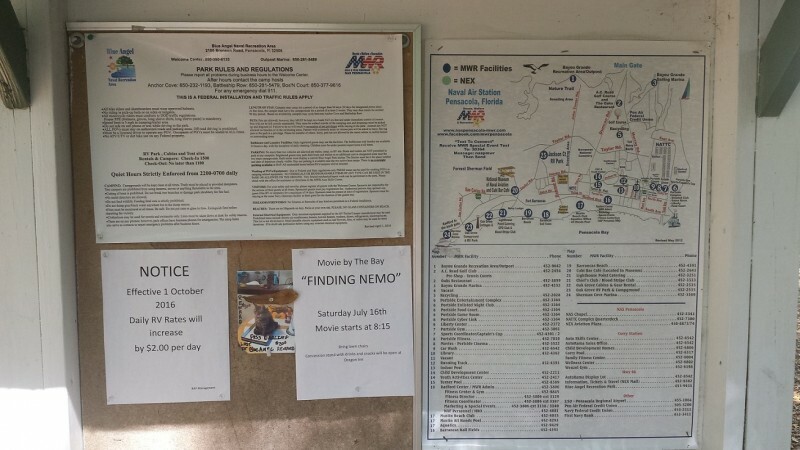 There are miles of walking trails and its an easy drive to the base with an amazing Naval Aviation Museum and a terrific lighthouse. 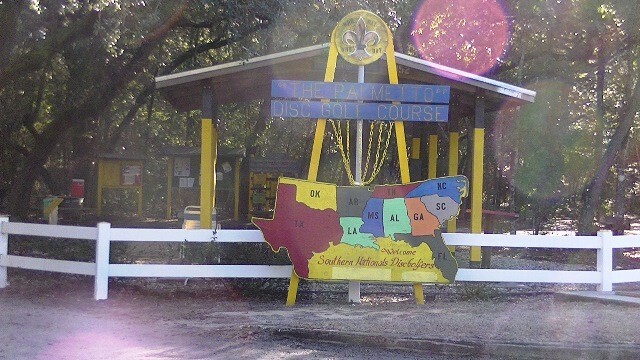 My family and I had a GREAT time at Blue Angel Recreation Area (Battleship side). The staff were very nice and accommodating. 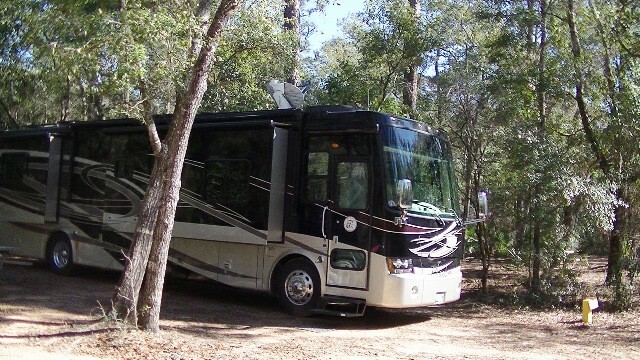 As soon as we got there, we hooked up our RV to the sewer and electricity lines and walked to the beach! The sites aren't on top of each other and they're very quiet. 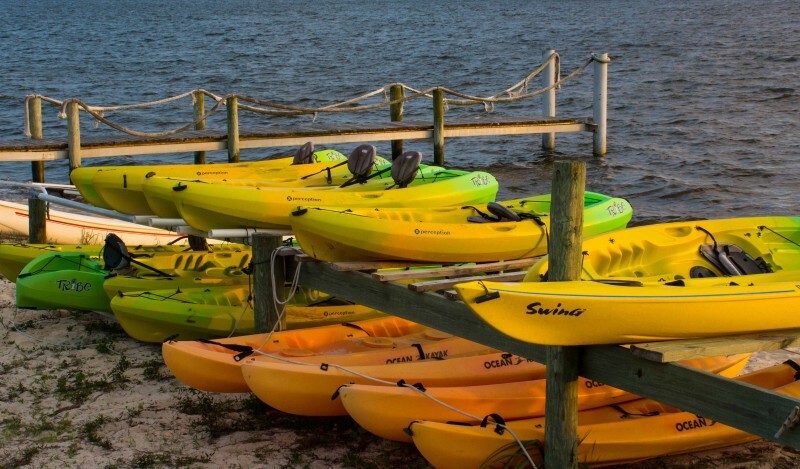 We rented a couple of kayaks during our stay and the rental fee was inexpensive. 2 (2 person) Kayaks for 3 hours was 38 dollars. There's a Walmart and Target nearby in case you need anything, Pensacola Naval base with the national aviation naval museum and Light tower and Destin is about an hour away. Like I said, we had a great time and WILL go back as soon as the opportunity presents itself. 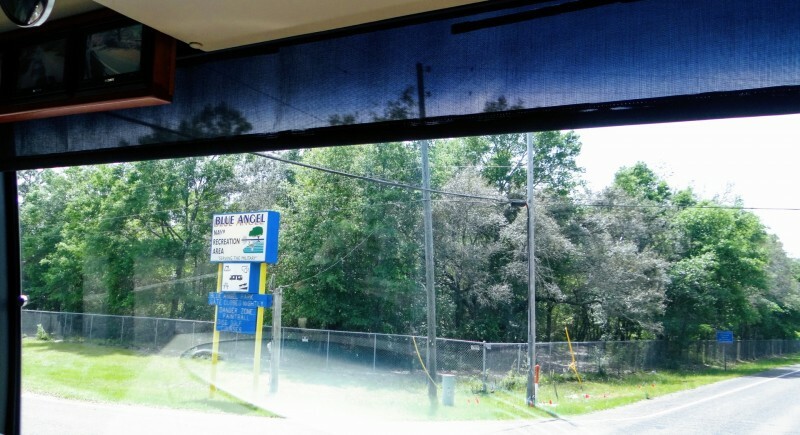 My only concern is making the sign on Bronson road a little clearer to drivers. There's a sign informing of the turn a quarter mile away (small brown sign) but it's still pretty sudden when you get to the turn. It's only a 2 lane road so you have to be cognoscente of oncoming traffic and the vehicles behind you. Beside that, we love it. Thank you to the site staff for being great! 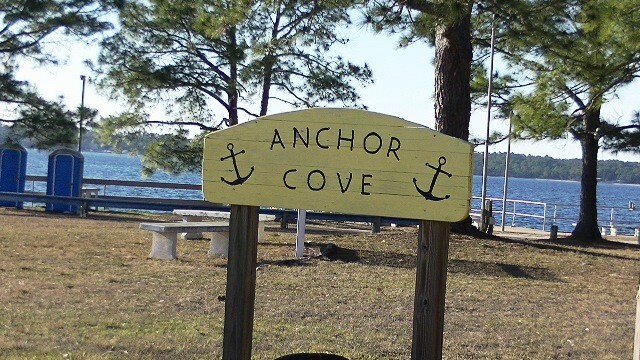 We stayed 4 nights in anchor cove, the campground is somewhat off the beaten path but that is one of the things I truly loved about it, it was very quiet and peaceful. Camp Host was very helpful. Your about 20-30 minutes into Pensacola or Orange Beach Alabama. The park is right on the water and and the view is nice to say the least. Will definitely be going back. It was a truly enjoyable time. We stayed three weeks in the Battleship Row part of the park. Originally were going to stay our first two nights in Anchor Cover but due to a cancellation were able to stay the entire time in Battleship Row. Don't think I'd be comfortable trying to maneuver my 45' MH in Anchor Cove. Park is on the water....the old sea plane section of war time Pensacola. Great walking and the sites are superb. Concrete, nicely landscaped, and at the right price. No wifi but the Verizon signal was good so wifi worked just fine. We were able to hook up our satellite but I could see how that might be a problem in some sites. It's a bit of a road trip to get out to most things but this is a great park and we will most definitely be back. $22 p/night. 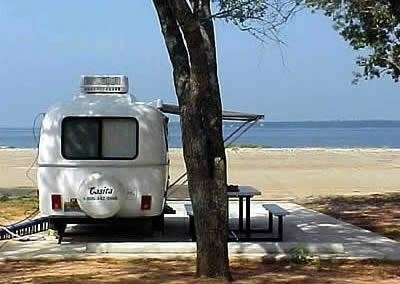 This was our 2nd stop on our 1st RV trip ever, we stayed in the anchor cove side of the campground, it was wonderful, quiet and peaceful. we will be staying there again thats for sure. 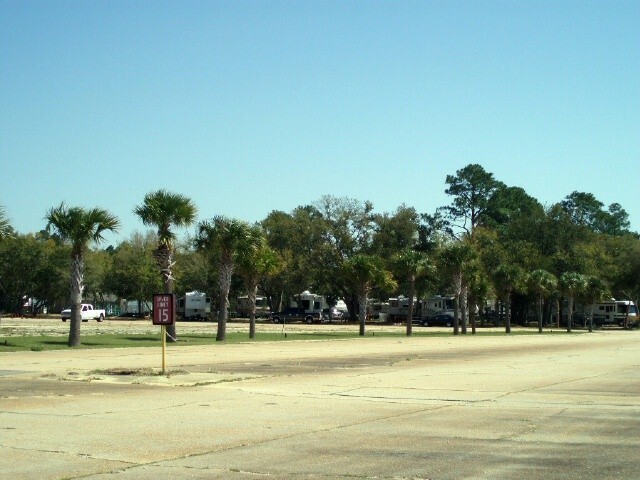 The Battleship Row side of Blue Angel Naval Recreation Area is a wonderful RV park. We would stay there over and over again. We were there 3 months from December to March. The sites are far enough apart that you have plenty of elbow room - don't feel crowded at all. Each site is a concrete pad and very level. All roads are paved and in excellent condition. The grassy areas are kept up and I never saw any trash around. Even though there is a 90 day limit, none of the sites look like people have taken up homesteading. Its a great place for daily walks and bike riding. 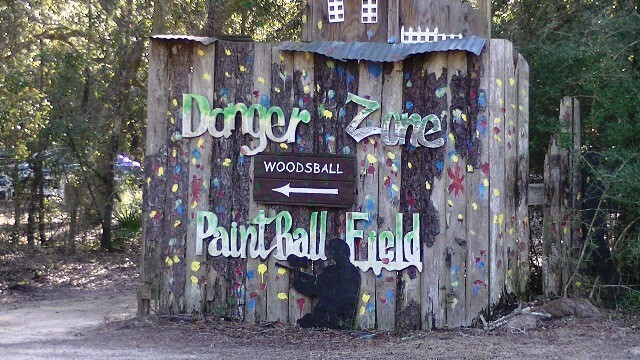 There is a paintball place behind the park and also a frisby golf course. 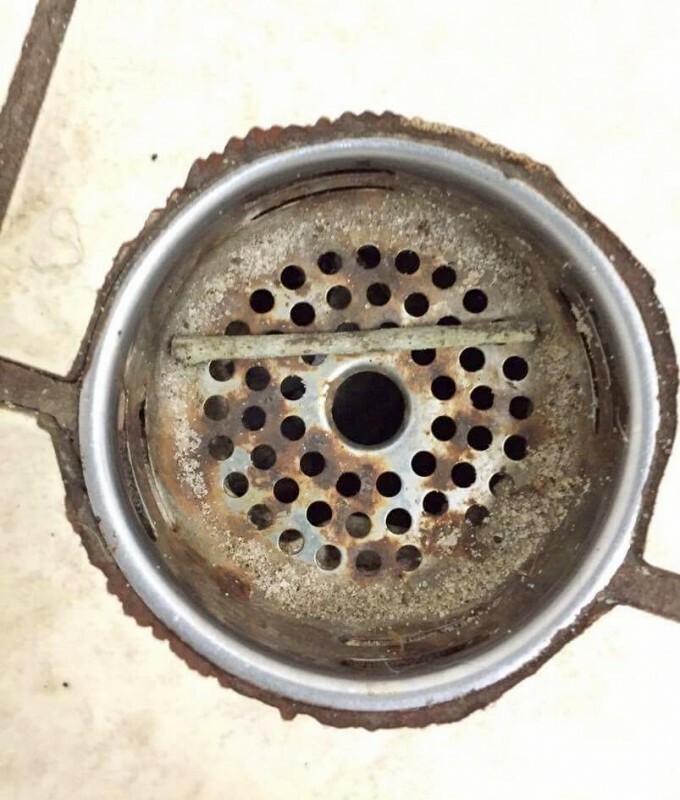 All utilities worked perfectly. The host was really friendly and helpful and the location on Perdido Beach is very scenic. Our only complaints were there is no wifi - none at all. The location is out of the way. It's about 10 to 15 miles from the most popular things like Walmart, restaurants, etc. The 2 mile road (Bronson Rd) off of Hwy 98 is rough going and after awhile it gets on your nerves. There is no clubhouse for pot lucks or get-togethers. Now, if wasn't for those 4 things, this park would be perfect! This was our first time staying here and there is only one word for this place.... OUTSTANDING. We stayed at Anchor Cove which has no sewage because Battleship Row was full but we had a wonderful site. We were in A2 so we had the water right in front of us and it was beautiful. The staff is outstanding. We are going back many more times. We have stayed here several times and always enjoy our visit. 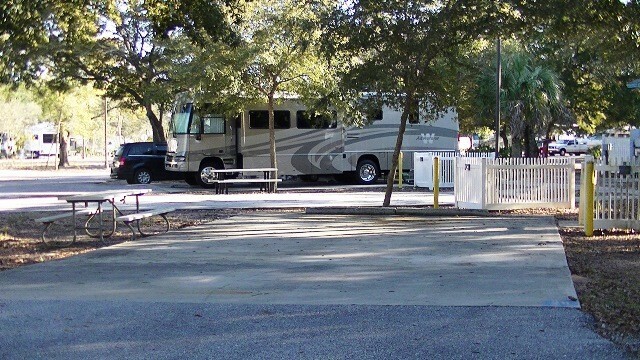 We had a front tow site in Battleship Row, right across from the water. Our site was shaded, concrete, level and spacious. We love the room to ride our bikes and take the dog for a walk. Very quiet and peaceful. Stores are a 10 minute ride away and the commissary is about a 15-20 minute ride just down the highway. No cable but our satelite worked great. Mike in the office was friendly and helpful. We will be back! Stayed in Battle ship row from 4th thru 11th. move to Anchor cove for last few days. place was great clean and well maintained. Not as advertised for internet. NONE there. gone for about 2 years now according to the staff. will stay there again had a great time and a lot to do. First visit to this facility. Stayed at Anchor Cove without full hookups. This facility was very nice and all the staff I met were helpful and friendly. Would recommend this facility to all. There is also a lot to do in the area. Many walking and bicycling paths. Will return. 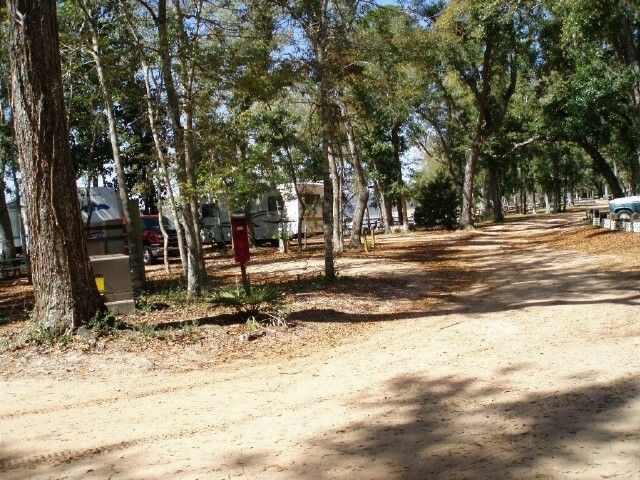 Beautiful, well kept campground. Many thanks to camp host J.D. who made checking in and finding a lot very easy and fast. Also thanks to Mike at the Welcome Center for his kindness while driving to Pensacola and then help extending our reservation. 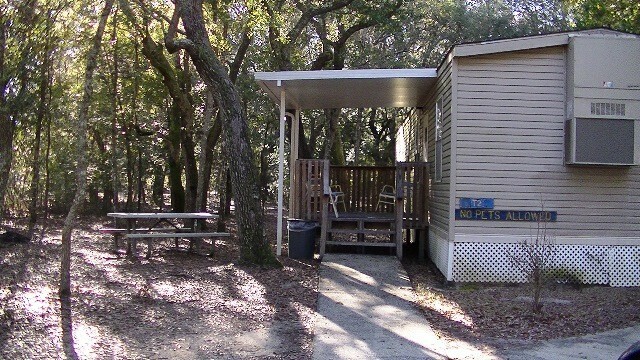 The park grounds are well maintained, and the bathroom/laundry facilities are clean. 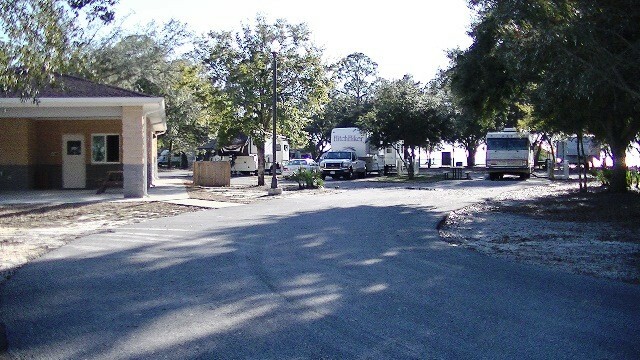 Stayed at Battleship Row from a recommendation from a friend and he was correct that Battleship Row is nice, quiet, relaxing and clean RV park. The showers and laundry were clean. Check-in was easy and the front desk was informative in get us to our spot. They are first come first serve and we were given great directions and wonderful recommendations of spots. Once your get used to the area, the drive to the Navy Shopping Center and other sites are easy to get to. Spent the day at the National Naval Air Museum which is was a great experience. We even witness a change of command/retirement ceremony. A couple of downfalls to this park is no cable or internet. It is a shame that in this day and age that these are not available. This park is highly recommended as a way to detox from technology. 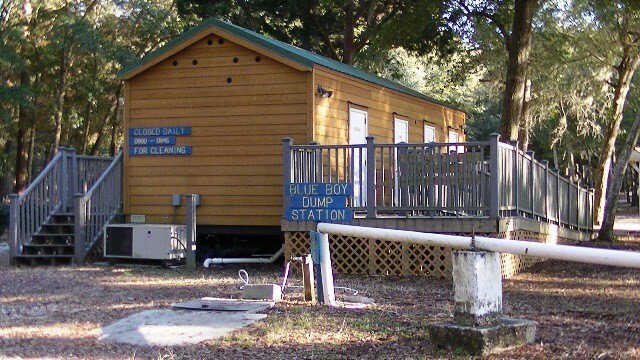 The camp host for Battleship Row was very helpful and friendly. 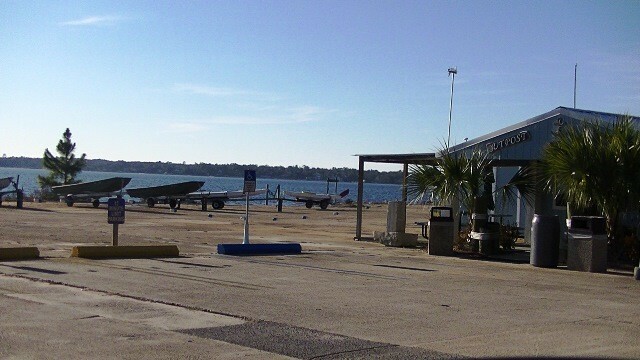 The view of Perdido Bay was great over looking the WWII seaplane ramps. Although the weather was hot the breeze off the water and the trees sure did help. The park area was clean and well kept. Beautiful place, right on the bay, we stayed at the Anchor Cove side. 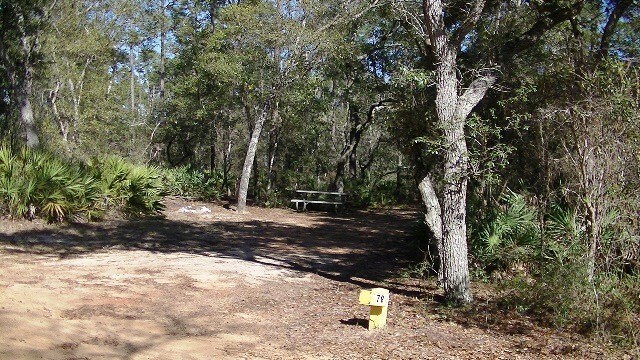 The campsite was nice, plenty of room between campers and quiet. I can not fault this place for it's beauty, plenty to do from mini golf to renting out a canoe. If the weather is bad, nothing indoors to do so plan ahead for the kids. The sunsets over the water is beautiful. Lots of hiking paths, nice play area's for the little ones. 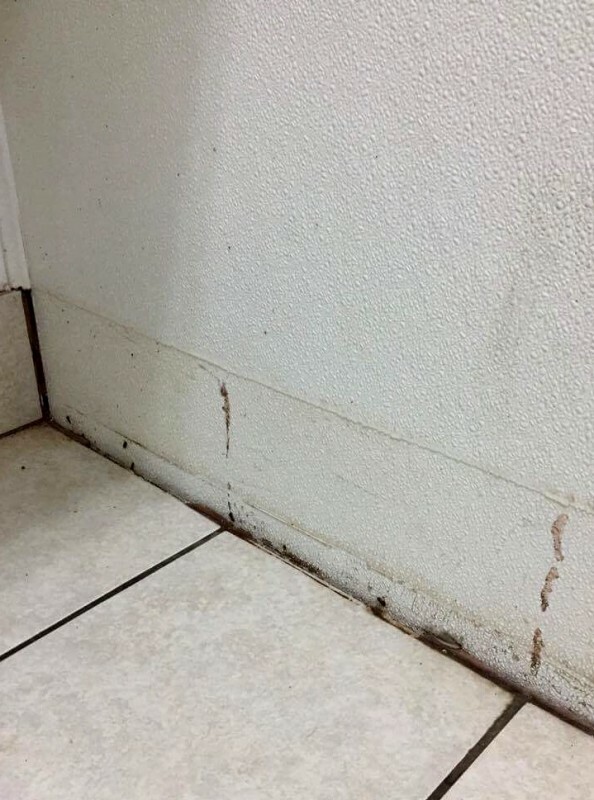 The bathrooms at Anchor cove are not great. We always drove down to the battleship row family restrooms, which were always clean, large, and air conditioned. Right next to the restrooms is where you have to go for the laundry facility, so it worked out well for us. If I can attach some photo's of one of the restrooms at Cedar Cove I will. 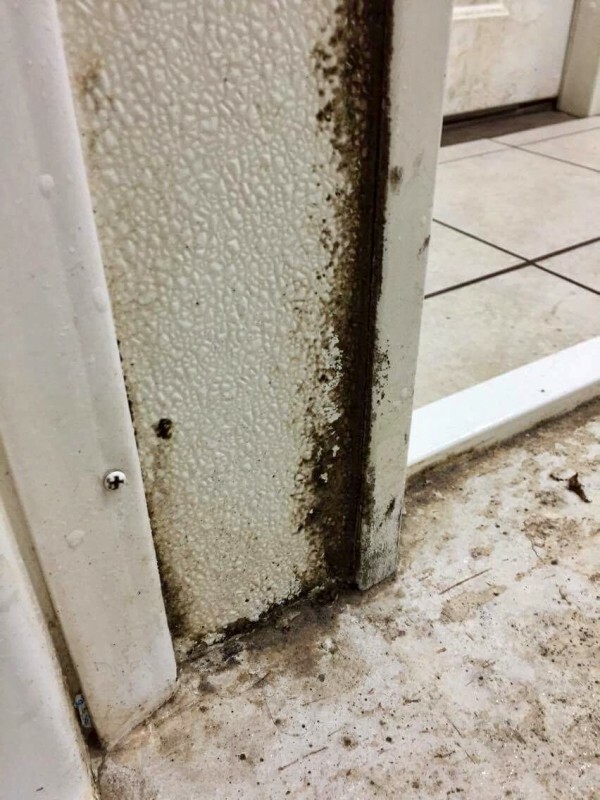 Unfortunately for us, the manager here seems to dislike all dogs, there is NO WHERE to let your dog run free, even if you have a well voice trained dog. My suggestion, take a long extention leash, If your dog is a swimmer like mine, you can go to one of the boat ramps and let your dog swim with the long leash on, Or at least they can paddle their feet. There is no dog park here. 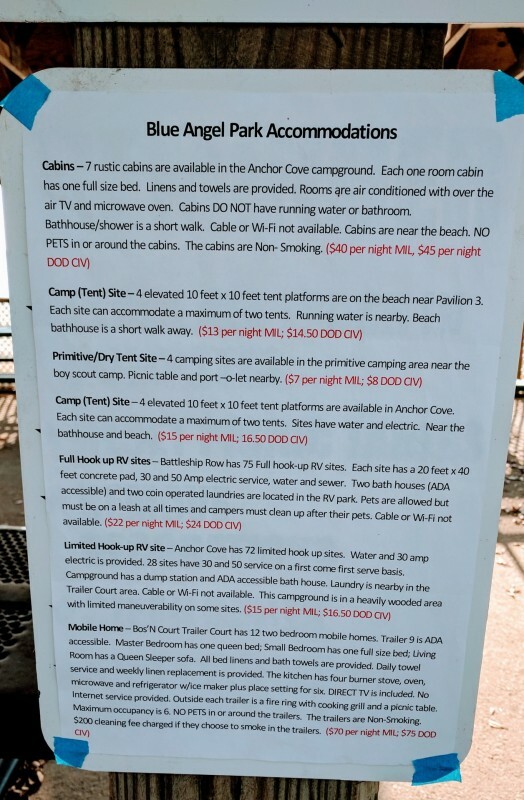 You can't take your dog to any of the beaches here anymore either, you will have to leave them inside your very hot tent, or camper, maybe your dog is lucky and you have a/c. I was yelled at one day by the manager, I had just tethered my dog up outside by the picnic table, I then popped inside to pour a drink to take back out when I heard my dog start to bark, I stepped out immediately knowing someone must be coming by and right off the bat I was being yelled at and a finger pointed towards my dog, he was shouting as he kept walking by "NO DOG MUST EVER BE LEFT UNATTENDED - NEVER!" I was so shaken at being shouted at by I just clammed up and ran and hugged by dog, this man scared me, and I had no clue he was. He just kept walking no introduction or waiting for me to explain that my well behaved dog was being left for under a minute. Later that day, my husband found out this gentleman was the manager. I do not like confrontation, and I always obey rules, this rudeness literally took me to my camper for the rest of the day, I have never in all my life been yelled at and it really upset me, not what he said, but the tone used and the look of anger on his face. My husband wanted to go and knock on the managers door, but I stopped him, I just wanted to leave. The next morning we packed up camp early and left. Looking back, I wished I'd stood my ground and spoken up, but that's the past now. A lot of the staff aren't friendly either, with the exception of Mike and the very nice man in the shop. Don't expect a warm greeting from the camp host at number 10, he simply stares and ignores you! Do I recommend this place? Yes, If you don't have a dog, We personally won't be back, as like many people our dog travels most places we do. I had heard about the new management changing a lot of things for the worse, I really didn't expect a man with a very bad temper to be hired on in a customer service type job.